In this lesson the exercise (or the torture, especially at the beginning) that Simon Ghnassia proposes to do has the goal to help you assimilate thoroughly the 5 positions of the pentatonic scales. 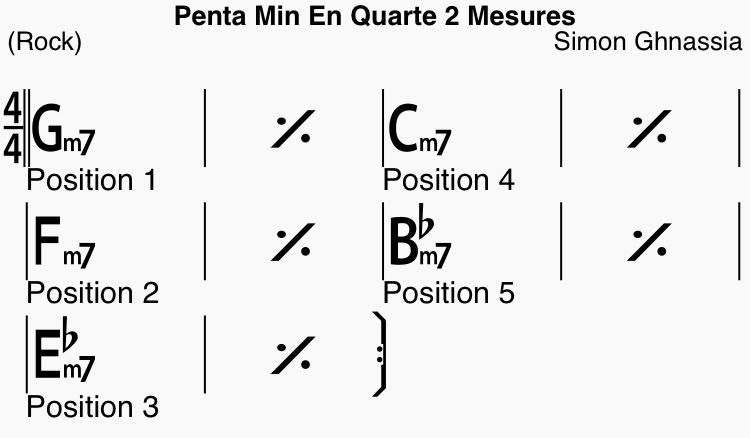 The goal is to play all the pentatonic scale positions (in minor in this case) by changing position at each chord with a fourth interval but staying on an area of 5 frets. Rules of the game: you have to stay all the time between the 3rd and the 7th fret. We go up and down the penta doubling the last note when we go down. 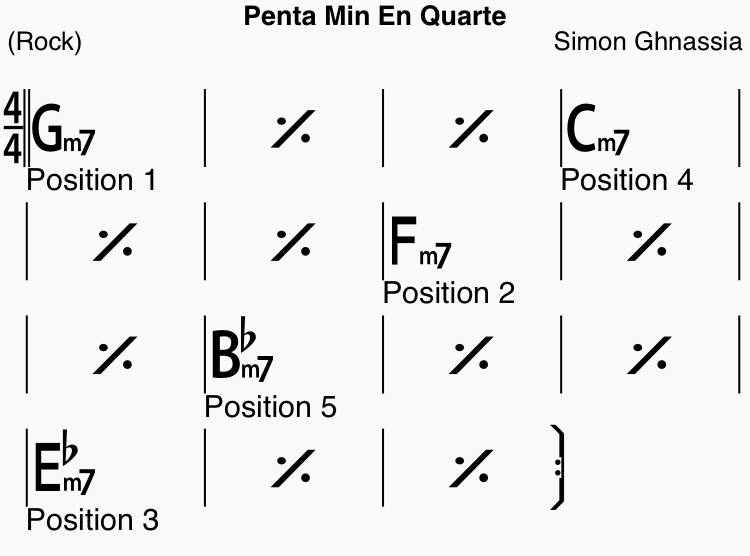 The exercise is not very musical but it's an excellent way to master the 5 positions of the pentatonic scale. There are 3 bars for each chord to allow each pentatonic to go up and down completely. This gives a weird aspect to the chart but the goal here is to work the positions to put them well under the fingers. We will try to do some music with the next chart. Note that in this version, you loop the chart on itself but the original exercise recommended by Simon is to continue then on the next fourth chord, Abmin7 in that example to cover the whole fretboard. In this chart this time we have 2 bars per chord. The goal here is to phrase on each of the pentatonic positions while always respecting the constraint of remaining in the same area of 5 frets. Trust me this exercise will really help you to get all 5 positions of the ever useful pentatonic scale under your fingers. Very often we stick to the first position of the minor pentatonic and get away with it, not anymore! With a little of practice you will open up a whole new world on your fretboard. Until the next lessons or interview, keep on playing the guitar!